Framed copy of the first installment of Tales of the City in the San Francisco Chronicle. It was 42 years ago today that the world was introduced to Mary Ann Singleton, a naive young woman from Cleveland, Ohio, who was visiting San Francisco on vacation when she impulsively decides to stay. She found an apartment at 28 Barbary Lane, the domain of the eccentric, marijuana-growing landlady Anna Madrigal. 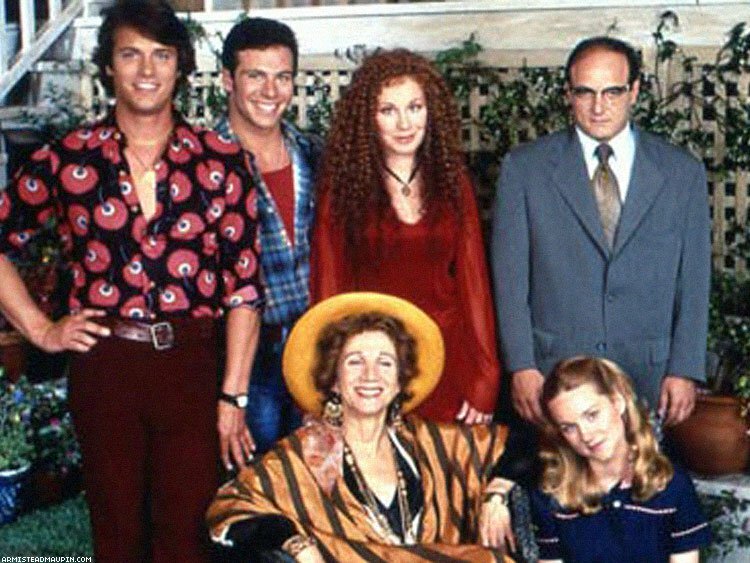 Mary Ann becomes friends with other tenants of the building: the hippyish, bisexual Mona Ramsey; heterosexual lothario Brian Hawkins; the sinister and cagey roof tenant Norman Neal Williams; and Michael Tolliver, a sweet and personable gay man known to friends as Mouse. 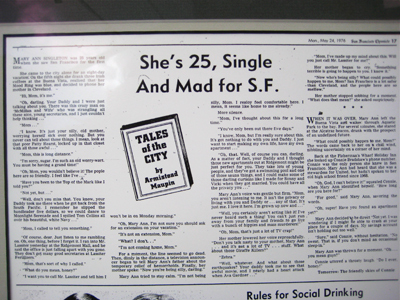 The first installment of Tales of the City was published today, May 24, in 1976, in the San Francisco Chronicle. 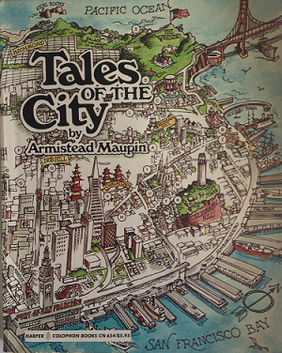 Tales of the City became a series of nine novels written by Armistead Maupin. The stories from Tales were originally serialized prior to their novelization, with the first four titles appearing as regular installments in the Chronicle, while the fifth appeared in the San Francisco Examiner. The remaining titles were never serialized, but were instead originally written as novels. Beyond the house, lovers and friends guide Mary Ann through her San Franciscan adventures. Edgar Halcyon, Mary Ann's and Mona's boss; Edgar's socialite daughter DeDe Halcyon-Day; and DeDe's scheming bisexual husband Beauchamp Day all provide a glimpse into a more affluent Californian class. Mother Mucca, Mrs. Madrigal's mother and owner of the Blue Moon Lodge brothel, brings mystery and comic relief. D'orothea Wilson returns from a modeling assignment in New York to resume an affair with Mona. Jon Fielding, Michael's lover and DeDe's gynecologist, becomes part of the social group. Michael's lovers later in the series include Thack Sweeney and the significantly younger Ben McKenna. Because installments were published so soon after Maupin wrote them, he was able to incorporate many current events into the plot of the series, as well as gauge reader response and modify the story accordingly. At one point Maupin received a letter from a reader who pointed out that Anna Madrigal's name was an anagram for "A Man and a Girl", and Maupin "appropriated the idea." Maupin's books are also some of the first to deal with the AIDS epidemic. Real life people such as Jim Jones and a thinly veiled Elizabeth Taylor are mentioned in the story lines. A prominent closeted gay celebrity is represented as "______ ______" throughout the third novel, with sufficient detail available to deduce that it could be Rock Hudson. In 1993, the first book was made into a television miniseries, produced by Channel 4 in the UK and screened by PBS in the U.S. the next year. The second and third titles in the series made their television debuts in 1998 and 2001 on Showtime. The series featured Laura Linney as Mary Ann Singleton and Olympia Dukakis as Anna Madrigal. In June 2017, Variety reported that Netflix was developing a new installment, with Linney and Dukakis attached to reprise their roles. Maupin will be an executive producer, Alan Poul will direct, and Michael Cunningham wrote the first episode script. The project is envisoned as a 10-part series. I loved the first set of series when they were on PBS, and will look forward to this new one.....about time something of quality is being redone. Too many of these inane comedy pieces of rot that should have been left to rest in piece(s) are being remade. They're like a bad dream, much like these cartoon nightmares that keep on getting renewed (they must be cheap).